Our Powerex Kobelco KNW® laboratory series leverage an oil-free, risk free rotary screw design in a sound enclosure cabinet in order to minimize noise and system footprint. Dryers are sized with one pump in reserve with automatic valves to energize the reserve dryer as needed. Since the first compressor manufactured in 1955, Kobelco® has stayed one step ahead of the competition with constant innovation and dedication to quality. 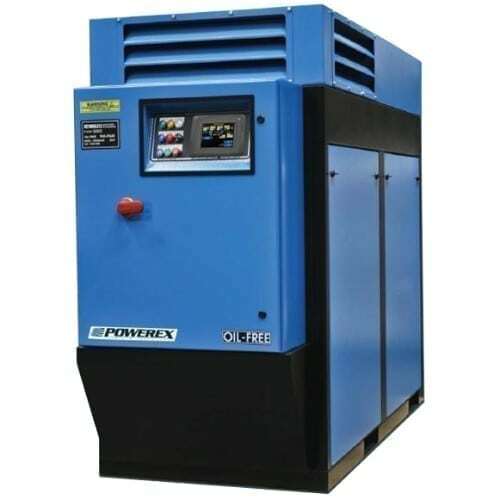 Long acknowledged to be the most efficient, low cost and reliable method for producing oil-free air, the Kobelco® KNW Series rotary screw compressor is available in sizes ranging from 20-100 horsepower. The Kobelco® KNW Series offers the most complete line available on the market. footprint. Air or water cooled models are available. Full sound enclosure with easy to remove panels provide quick access for routine maintenance. Quiet operation 64-74 dB(A) is standard for both air and water cooled models. A premium efficient, EISA heavy-duty motor is flange mounted to the compressor for permanent trouble-free alignment.